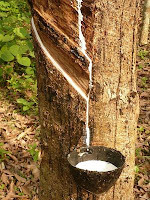 Weakness prevailed in the domestic physical markets for rubber, tailing the weak sentiments in the international markets. Though there was favourable change in weather triggering tapping in almost all plantation areas but there was no substantial improvement in arrivals. Spot prices for RSS-4 variety closed at Rs 208/kg compared to its previous closing of Rs 209.50/kg, while the RSS-5 variety closed at Rs 206/kg compared to its previous closing of Rs 207/kg. In the futures market, the contract of RSS-4 for October delivery closed at Rs 209.98 compared to its previous closing of Rs 209.83, while the contract of November delivery closed at Rs 207.05 compared to its previous closing of Rs 206.75 on the National Multi Commodity Exchange.